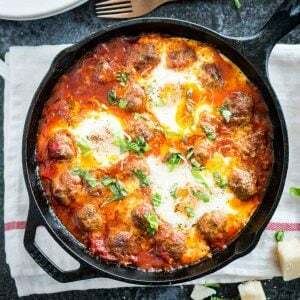 These Italian Baked Eggs and Meatballs are the BEST comfort food! Easy homemade meatballs and sunny side up eggs are simmered in a smooth marinara sauce – a delicious brunch dish that makes a great dinner, too. These Easy Crockpot Italian Meatballs in Marinara Sauce are probably one of my favorite comfort food. 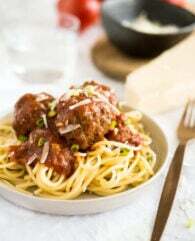 The Italian spiced meatballs and the smooth tomato sauce are so comforting and easy to whip up. But today’s recipe makes this easy dish even more delicious. Who doesn’t love to dip a slice of rustic white bread into a runny egg yolk?! 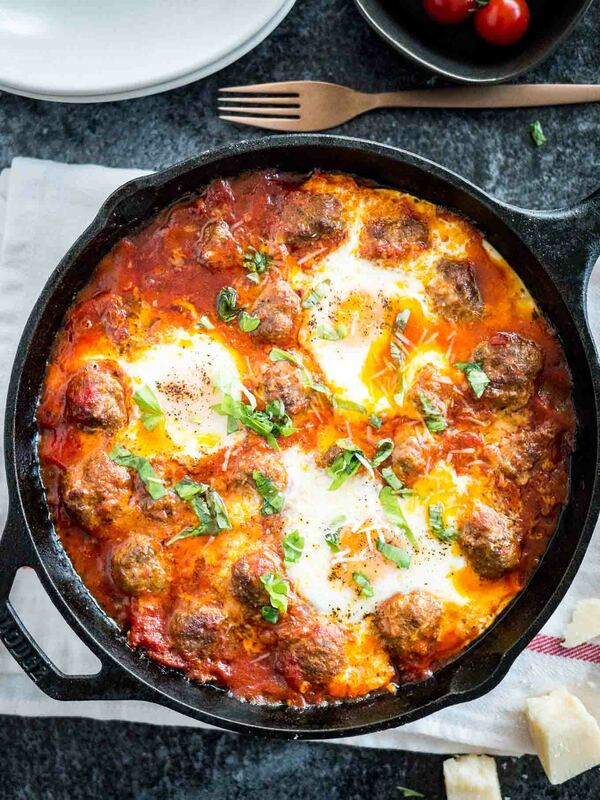 These Italian Baked Eggs and Meatballs are the perfect cozy dish for brunch and dinner. You can basically eat it all day! 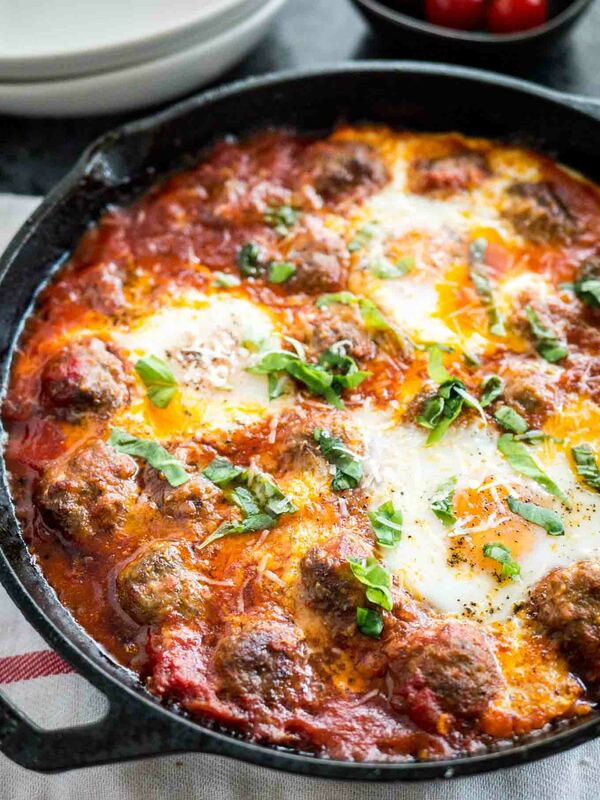 My favorite foolproof meatballs are simmered in tomato sauce and then topped with eggs that are baked to perfection in the oven. 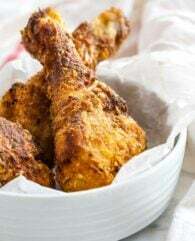 A family-friendly meal that only takes 35 minutes to make! 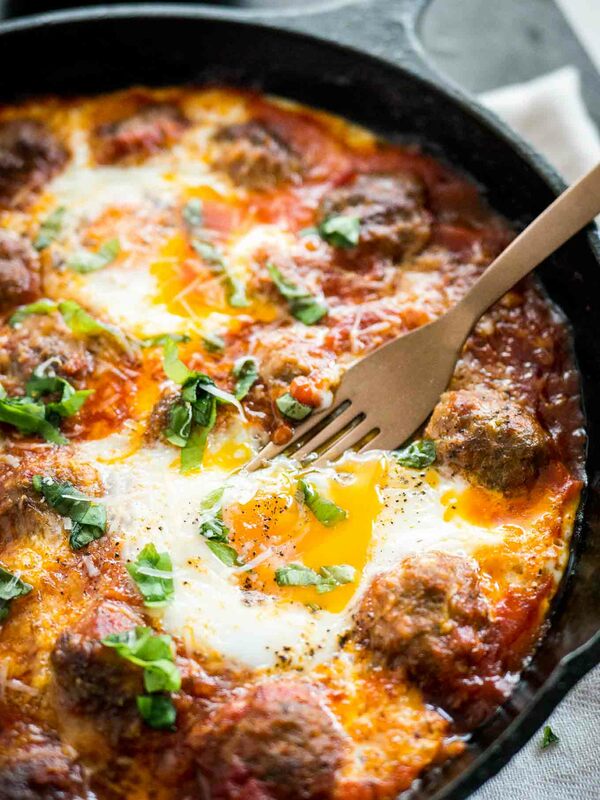 These Italian Baked Eggs make a great brunch dish but my family loves these for dinner, too. 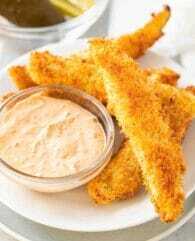 I serve them with some rustic bread on the side and parmesan sprinkled on top. This is one of those dishes that make you feel warm and cozy instantly! Most of the time I have everything I need for this easy meal at home which makes it super convenient. A few weeks ago I started to freeze ground beef. 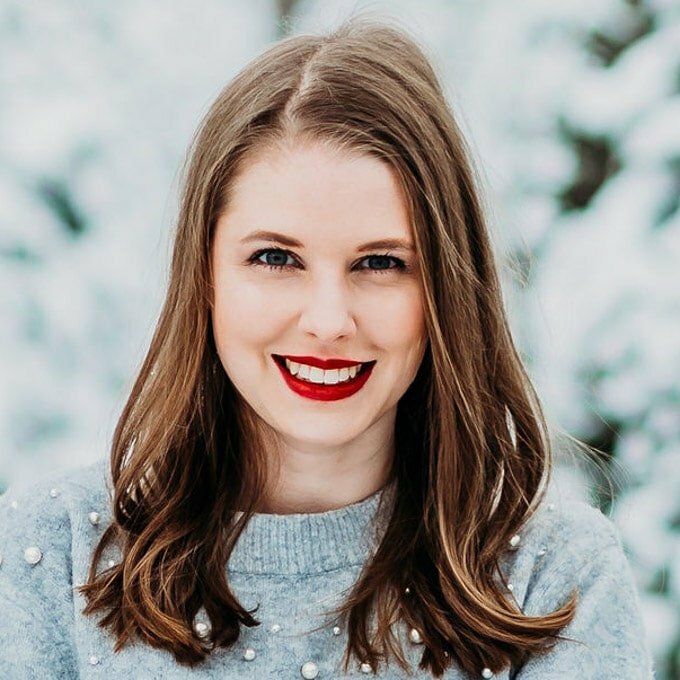 I always had the problem that when I bought ground beef on my weekly grocery run it started to go bad even before the expiration date was reached. So now I immediately freeze the meat when I come home and have “fresh” ground beef ready for when I need it. I transfer it to zip-lock bags and pack it really flat so that it defrosts quicker. This saves me money and time! for the parmesan cheese if you want to grate it yourself which I recommend, it just tastes better in my opinion and the cheese keeps fresh longer. While the oven is preheating start making the meatballs. Just combine everything and shape the mixture into small meatballs. If you have more time you can cover the prepared meatballs with plastic foil and let them rest in the fridge for a few minutes to firm up more but I’m not really a patient person so I start to fry mine as soon as they are shaped. Now it’s time to make room for the eggs. Use a spoon to make little dents into the tomato sauce and crack one egg into each of them. Transfer the pan to the oven and bake for about 15 minutes. 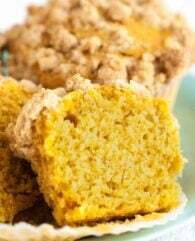 We like our eggs soft but you can bake them a little bit longer if you want them more done. These Brown Butter Maple Glazed Roasted Rainbow Carrots are the easiest side dish ever yet they’re elegant enough for special occasions like Easter dinner! If you’re looking for a recipe to make with your new Instant Pot you need to try this Instant Pot Carrot Soup Recipe or my favorite Instant Pot Chili Recipe, both are perfect for Instant Pot beginners. 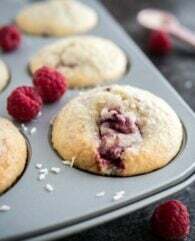 And if you have a sweet tooth then you need to check out these Raspberry Lemon Curd Cupcakes! 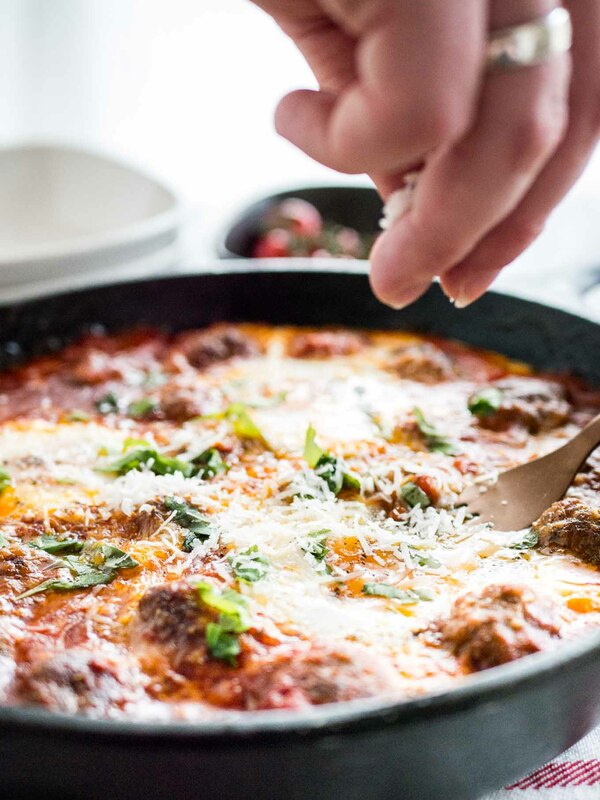 These Italian Baked Eggs and Meatballs are the BEST comfort food! A delicious, easy brunch dish that makes a great satisfying dinner, too. Prepare the meatballs: Combine the ground beef, breadcrumbs, egg, dijon mustard, oregano, salt and pepper in a medium bowl. Use your fingers to work the meatball mixture together. Work only until all the ingredients are evenly combined. To shape the meatballs, pinch off a few tablespoons of meatball mixture and shape into balls with your hands. Heat olive oil in a cast iron pan over medium-high heat. Saute meatballs for about 5 minutes until nicely browned. The meatballs don't need to be cooked through, they will get cooked completely in the oven. Add marinara sauce and water to the meatballs and simmer for 2 minutes. 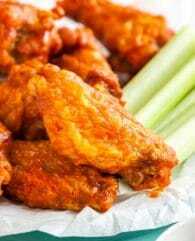 Sprinkle parmesan on top and make 3-4 dents into the marinara sauce. Crack eggs into dents. Season eggs with salt and pepper. Transfer cast iron pan to hot oven and bake for about 15 minutes or until eggs have desired consistency. 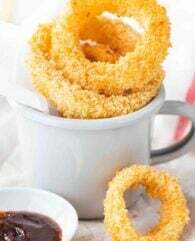 Garnish with basil, parmesan cheese and serve with bread.